Serve Rocky Mount is a way that we demonstrate our love for our city. We want to demonstrate the renewing and restoring work of Christ through our actions. Join us as we set aside a week to serve and love our city. Serve Rocky Mount is our opportunity to show the love of Jesus to Rocky Mount. This year, Serve RM will take place from Sunday, April 28th - Saturday, May 4th. Please look at our schedule of service projects below and please tell us which projects you plan to serve with by registering below. 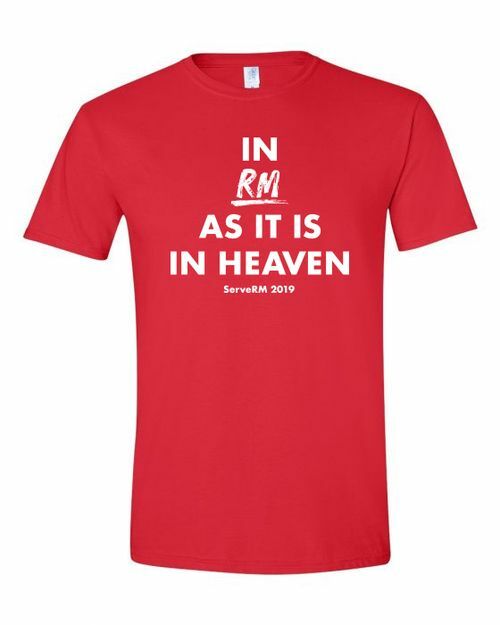 All early bird registrants (by Tuesday, April 2nd) will then pick their shirt up at the prayer meeting on Sunday, April 28th at 6PM at 2020 Old Mill. Contact Daniel Tripp at Daniel@redeemerchurch.com for more information. All service projects will be led by specific life groups. We would love for everyone to sign up to serve with their life group and with other projects too! All of Redeemer will gather on Sunday (4/28) evening, April 28th at 6pm to pray together and ask God to bless our efforts during Serve Rocky Mount. You will also collect your shirt at this service if you registered for Serve Rocky Mount by April 1st. The service will last about an hour and childcare will be provided. Contact Daniel at Daniel@redeemerchurch.com for more details. Landscaping at Red Oak Middle School in the evening. This will be led by the Holland/Sia and Morris Life Groups. Contact Seth Holland at 252.908.5736 or Michael Morris at 828.713.2997 for more details. Preparing Goodie Bags for mothers with Christian Adoption Services. This will be led by the Cheney Life Group. Contact Rich Cheney at 252.908.0872 for more details. Preparing Goodie Bags for the teachers at Faith Christian School and bringing them a breakfast. This will be led by the Hartman Life Group. Contact Dayton Hartman at Dayton@redeemerchurch.com for more details. Landscaping and outdoor beautification at Your Choice Resource Center (The Pregnancy Care Center). This will be led by the Carlisle Life Group. Contact Phillip Carlisle at 252.326.2383 for more details. Serving an early morning breakfast for the RMPD. This will be led by the Tripp and Boone Life Groups. Contact Daniel Tripp at Daniel@redeemerchurch.com for more details. 9am-12:30pm: Join us for a work day at Peacemakers (1725 Davis St, Rocky Mount, NC 27803). We are asking everyone available to come out from 9 am - 12:30 pm to work, serve, and beautify homes for one of the most important ministries in Rocky Mount. This will be led by the Mains and Jordan/Brooke Marshall Life Groups. Contact Taylor Mains at 252.904.2939 or Jordan Marshall at 252.469.7598 for more details. Landscaping and outdoor beautification for Williford Elementary School. This will be led by the Jeff/Mary Ellen Marshall Life Group. Contact Jeff Marshall at 252.314.7477 for more details.